Even Don Draper meditates. And when he does, the fictional ad titan comes up with a seminal feel-good commercial for Coca-Cola that teaches the world to sing in perfect harmony. Should everybody be saying oooooommmmm? No one is promising that advertising executives, or any other corporate workers, will stumble upon The Next Big Idea by doing yoga. But there's a growing workplace trend where businesses of all stripes are facilitating wellness for their employees through perks like meditation classes, napping pods, massage therapy and organic goodies. Unlike Draper, employees don't have to leave the office to look for enlightenment. Once the province of Silicon Valley startups and their fierce talent grab, health-and-well-being programs are becoming standard at companies across the country, from insurance giant Aetna to General Electric to MGM hotels. Jane Buckingham, CEO of trend forecasting and media firm Trendera, said it's in companies' best interests to take better care of their workers. Even though they have to absorb the initial costs, healthcare expenses overall will likely decline. "It's preventative medicine," she said. 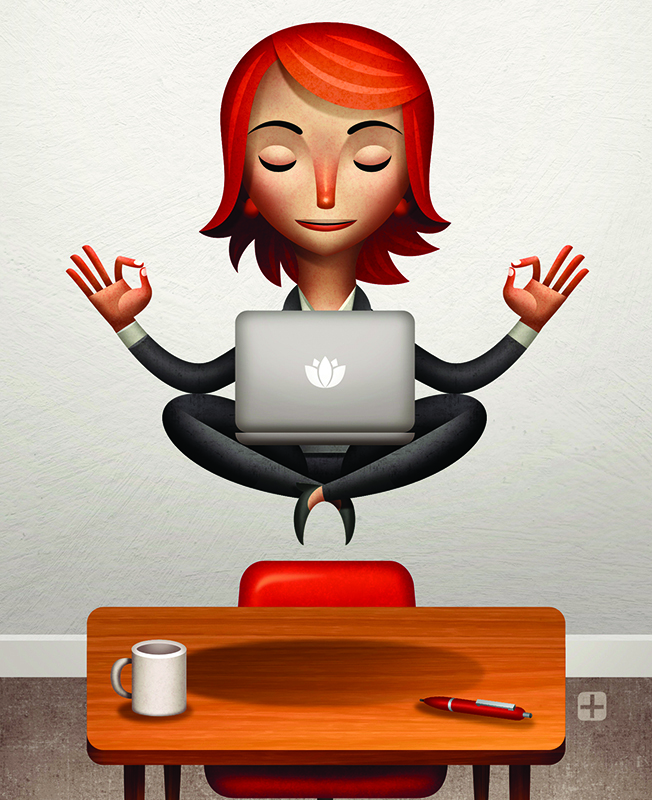 "Studies show that meditation and living healthy lives make people more productive. They're less frazzled by heavy workloads; they're less likely to be overwhelmed." Firms that specialize in "conscious leadership consulting" are popping up coast to coast, as are walk-in studios like Los Angeles-based Unplug, which has been called "the Drybar of meditation." It provides half-hour sessions of guided meditation under the slogan, "Hurry up and slow down." Ad agencies and media companies are joining the Zen movement in trying to combat employee stress on and off the clock, funding staffers' charitable side projects and providing on-site wellness checks and gyms. Crispin Porter + Bogusky, for a time, had a former Buddhist monk ensconced at its Boulder, Colo., headquarters to provide mindfulness guidance to the creatives there. It was the brainchild, no surprise, of agency guru Alex Bogusky. Bogusky said he brought in Greg Burdulis to "potentially lift the organization as a whole" in hopes of "making the agency a more positive influence" in business. The most highly stressed workers sought out the former monk, somewhat monopolizing his time, Bogusky said, leaving less room for the group sessions Bogusky had envisioned. Looking back, he thinks he could've benefitted from more meditative hands on deck. "It's important that programs address people in crisis but also appeal to people who feel great but have the potential to feel even better," he said. "It's not about counseling, it's about providing tools that employees can count on for them to be their best." Taking the concept further, some agencies have created full-fledged business units around their wellness-minded clients. Horizon Media, for instance, spawned Scout Wellness to consult with the health-themed marketers on its roster, and Saatchi & Saatchi Wellness helps its brands further their wellness messages and supports its own staffers' healthy living goals. Horizon, with on-site programs like hypnotherapy, acupuncture and financial counseling, has tapped into the "socialization of wellness," encouraging its employees to pursue healthy habits together, like training for team Tough Mudder races or building homes for Habitat for Humanity, said Scout Wellness managing director Rich Abend. "We're all asking people to work harder, longer, and be better at what they do," Abend said. "Companies need to provide a culture of community and wellness. And it isn't a trend, it's a lifestyle that's here to stay." And to show the importance of communications in the area, the Cannes Lions International Festival of Creativity added Health and Wellness awards to its program last year for the first time, logging 1,400-plus entries. That number has jumped by 30 percent this year. Beyond encouraging its employees to stay in top shape, physically and emotionally, the San Francisco-based ad, marketing and design firm John McNeil Studio has created a partnership with wellness entrepreneur Joe Burton. They've launched a digital platform that provides online mind-and-body training for individuals and companies. The venture, at Whil.com, offers 24/7 access to mindfulness, yoga and leadership sessions with the express purpose of helping people "live happier, healthier and more engaged lives," according to its mission statement. So far, the alliance has produced more than 500 training sessions, reaching upwards of 100,000 people in about seven months. The focus is on large communities like school systems and corporations. John McNeil, founder and CCO, said the agency wanted to be involved to "help shape a product and bring it to life." That reflects the holistic attitude it has in dealing with brands on its roster like Toms and Google. McNeil's agency is joining "a renaissance of sorts" happening in the workplace, he said, fueled by young, disruptive startups. "This isn't about checking out, it's about being more dialed in and ready to make the most of your work life and your broader life," McNeil said. "We're not saying you have to go to an ashram." Trying, or at least appearing, to be good corporate citizens is also vital now, Buckingham added, because "companies don't just want to be your bosses; they want to be your friends. They want to be liked." Offering flexible hours, quiet spaces known as "Zen rooms" and nutritious meals to go are just the beginning of that new approach to how to treat employees. Getting in their heads makes sense, too, because, as Buckingham said, "Meditation is the new therapy." This story first appeared in the June 22 issue of Adweek magazine. Click here to subscribe.